While on our Eastern PA Beer Tour this last weekend a number of beers stand out, but only one was truly unique. A “beer float.” I saw when Tröegs‘ new brewery and tasting room opened that “floating” their Scratch #57 Chocolate Raspberry Weizenbock was an option, I must say I was jealous. Upon learning that you could do this with any beer they had on tap, I was ecstatic. After the Nugget Nectar, Java Head Stout was the option that made the most sense. The ice cream takes this beer from black to a coffee brown with a huge brown head. The crazy mix of melting ice cream and head build a shield on the glass and lace beautifully. Ice cold to the touch. The head retention is unlike any other, and honestly is part of the treat. The smell is crazy sweet with a really nice added amount of coffee roast. The ice cream really dominates the aroma, but I love it. Again the taste has been dominated by the ice cream, but what I have in my hand is delicious. Coffee and roast remain from the Java Head but the sweetness and vanilla from the ice cream add a really decadent character. 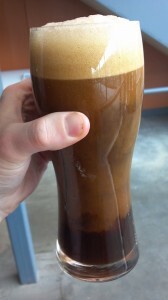 The head can even be assessed in this category, as it acted like a thick sort of syrup atop the beer. The beer is thick--like a dessert get it? The huge sweetness does hurt the drinkability a tad, but I'm not complaining. The beer stays really cold forever. $7 for a pint is pretty high for PA, but I'd say if you're at the brewery you have to try it. I also recommend you tweak it at home to your preference and save a few bucks. Overall a phenomenal new experience. As the ice cream melts it blends even more with the beer. It's unreal. I really hope they do a big chocolate stout, the float of that would be amazing. Last updated by Russ Beck at August 6, 2012 .